The Violet Temper goes against the grain with heartfelt, non-computerized art. Thursday, Jan. 31, 8 p.m. In his 2013 best-selling autobiography, The Smiths icon Morrissey described a friend as having a "violet temper." Those words stuck with Utah's Cache Tolman so much that the guitarist pays tribute to the sarcastic, witty Englishman in his new project, The Violet Temper, with drummer/vocalist Lindsay Heath. Morrissey is just one of the many muses Tolman and Heath draw inspiration from as they crash head-on into a new "doom shoegaze" alt-rock adventure. Every artist starts their journey somewhere. For Heath, it was at elementary school with a friend's drum kit at the tender age of 10. Self-taught, Heath began diving deeper into music when she got her own Tama starter drum set at 15. "It was so beat down, my cousin sold it to me for $150," Heath laughs as she reminisces. "I was so happy. I used to play along to Helmet records all the time." For Tolman, friendship guided the then-teenager to the guitar. "I joined Iceburn when I was 15, so naturally, I learned from the guitar player, Gentry [Densley], who was 21," he recalls. "He had six years on me, so I had to do a light-year's jump. I continued to play with different people, and that was my school." 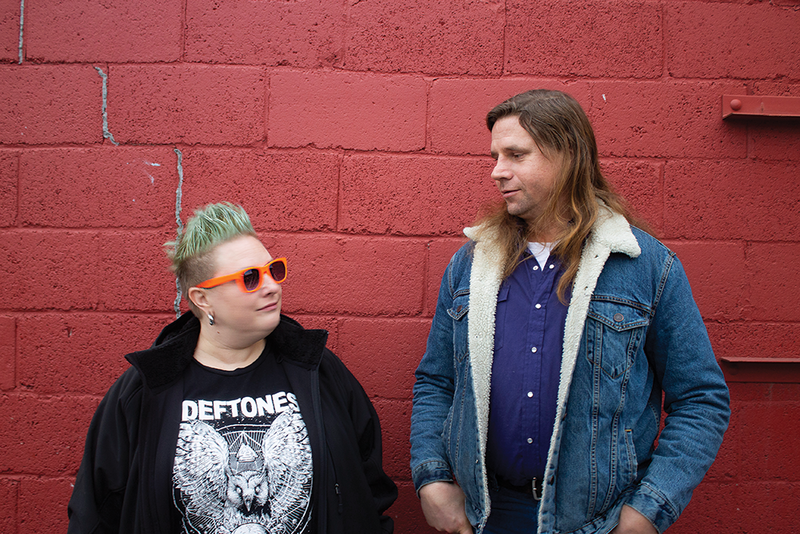 Those in Salt Lake City's underground music scene might recognize Heath and Tolman. This isn't their first time in the spotlight; together, both musicians have decades of experience on stage and in studio. Heath has performed in bands including Kid Madusa and solo on her 2014 album Holy Medicine. Tolman is also a fixture in the SLC music scene. Best-known for his mathematical avant-garde licks as the guitarist for the city's homegrown jazzcore band Iceburn Collective, which grew to underground fame throughout the '90s, Tolman has kept his music raw and unscathed, avoiding the overproduction that so many bands fell victim too. Alternative rock in the '90s was loud, fast and honest, but eventually, the digital age came, and alt-rock went from a niche taste to the status quo, heard on radios nationwide. "Sometime in the '90s, rock music got put on a grid," Tolman explains. "What that means is, [record companies] put it to a computer grid so that [rock] sounds like dance music, making it 'perfect.' In my mind, they've destroyed rock 'n' roll music." Tolman began his quest to find a like-minded artist and make rock pure again. Around 2002, he went to a local show at Kilby Court and witnessed Lindsay Heath's earth-shattering chops on the drums. "I'll just say that [Heath] murdered everyone else in the band," Tolman explains. "I said it in my head and to my mutual friend: 'She should play drums in Motley Crüe—she's great!'" After that show, however, it took a handful of years before the two would jam together. Tolman contributed stand-up and electric bass to the Lindsay Heath Orchestra, making him the perfect passenger for a new project. Ultimately, the two linked up in a last-ditch effort to fight computerized, generic music, and last year formed The Violet Temper. "I was totally starstruck," Heath explains. "I went from listening to Cache's band as a teen—that was my band that I was fan-girling, and that's how I learned to play. Now, I get to play with the real deal. I get to play with my favorite teacher." Before the release of their debut self-titled album in 2018, the two weren't always on the same page musically. It took long hours of practice and studio time to develop musical chemistry. "This project is really cool because it's even-steven as far as bouncing ideas off each other," Tolman says. "I wanted to figure out if it works, and now that I know it works, we can have more fun with the inner mechanics. After about the first four or five songs, I said. 'OK, this is going to work.'" Heath and Tolman wanted to keep their music simple yet complex, but how many sounds can be emitted from drums, bass and guitar? On The Violet Temper, recorded by friend and producer Andy Patterson at The Boar's Nest in Salt Lake City, the possibilities were infinite. "Everything you hear on this record, we are making that happen in the moment," Heath says. "We can recreate that sound anytime, anywhere. And the fact that Cache did the vocals live in the moment and nailed them is kind of unheard of." The best things really do come in pairs, and for The Violet Temper duo, every show, every song and every note counts. "My idea was, it needs to be fun," Tolman says. "If it's not fun, it's not music. We'll play a show, and it doesn't matter if there are 500 people there or five—we're going to have a blast and we know it."